Presuming you’re lucky enough to own a property with a flat roof, you might be missing a trick when it comes to making the most of your space. Creating a rooftop terrace on your home is not as complicated or expensive as you might imagine. With the tips and advice on this page, you should find yourself in the best position to build something fantastic. You might like to use it for social gatherings or alternative garden parties during the summer months. Also, it will be a brilliant place to watch all those local firework displays towards the end of the year. Before you do anything else though, you need to make sure the root on your property is strong enough to take the weight. In most instances, you will need to pay for a professional company to come in and reinforce your roof before you start work. Failure to do that could result in some pretty bad accidents when the structure collapses under all the extra weight. The job of reinforcing your roof should take no longer than a couple of days, and most of the work will be carried out inside your loft. The professionals will install new joists in strategic positions to strengthen your roof and guarantee your property remains safe. You now need to create a strong floor on your roof that will stand the test of time. You could lay some tiles like those in your kitchen, or you could build some decking similar to that in your garden. Either way, you’ll have to invest a decent amount of money to get the best results. Tiling is the cheaper option, but it tends to involve more work. You should make your decision based on the amount of money you have to spend, and what you hope to achieve from the renovation. You need to make sure it is impossible for anyone to fall from your roof. That is especially important if you plan to use the area for parties in which people will consume alcohol. Some people like to save money by erecting some standard terraces, but we think you need to do more. Experts like those at www.stainlesshandrailsystems.co.uk provide their clients with a much more sturdy solution. Steel handrails with glass panels are incredibly attractive, and they will help to keep everyone safe. 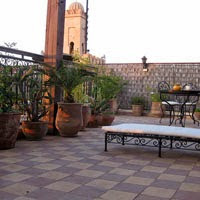 There is no need for you to keep your rooftop terrace looking plain. We think you would create a much more attractive area if you decided to add a splash of colour. Painting the decking or adding some flowers should work well. Some people even decide to grow vegetables or fruit on their roof because it gets so much sunlight. The decision is yours. We can’t wait to see what you manage to create when trying to build a new rooftop terrace. Feel free to send us your photographs and let us know how you get on. If you start working on the plan now, you could have everything sorted in time for the summer.